So last month, I forgot to hang the bout poster up here in Catazonia, and we had one of the lowest attended bouts ever. Is there some correlation? I seriously doubt it, but just in case...this month, you get three for the price of one. OK, OK...two posters, but three bouts!!! Is that directly correlating to your excitement level? 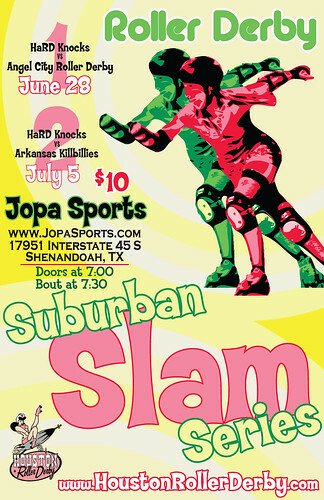 By the time HaRD Knocks plays that third advertised bout, next month's bout poster should be hanging here. You might be thinking to yourself that HRD is derbying this summer up but good. That's right...plenty of opportunities to come see me. I really miss you, but I hope to be sick of you by August. Wow, I thought by the way you pegged that "character" you had already been derbified. Come on out...you won't regret it!